For the eighth consecutive year--2019--Ellis Law Group, LLP has been named a "top tier" law firm in legal malpractice defense by U.S. News & World Report. Led by managing partner Mark Ellis, who was named a "best lawyer" in legal malpractice defense by Best Lawyers for the tenth consecutive year, Ellis Law Group attorneys have successfully defended hundreds of lawyers and/or law firms accused of malpractice, breach of fiduciary duty, fraud, ethics violations and malicious prosecution. More than 40 victories in attorney malpractice cases were won in trials with jury and bench verdicts. The 2019 U.S. News & World Report rankings can be seen in their entirety by visiting bestlawfirms.usnews.com. Mark Ellis was named a 2018 “Super Lawyer” in civil litigation by the national attorney-rating firm Super Lawyers. The honor, which recognizes Mr. Ellis' trial lawyer skills in general, complex and class action litigation, marked the fifteenth year Mr. Ellis has been so honored. Honorees are nominated by their peers and then evaluated by SuperLawyers' research team and a blue ribbon panel of attorneys. Mark Ellis and David Castro won a 8-0 jury verdict in federal district court April 17, 2017 defending a collection agency accused of violating the federal Telephone Consumer Protection Act (TCPA), the federal Fair Debt Collection Practices Act (FDCPA) and California’s Rosenthal FDCPA. In Littlejohn v. Financial Credit Network, Inc., the plaintiff claimed the defendant violated the TCPA by automatically dialing his cell phone 75 times over 19 months without express consent. The plaintiff also claimed the number of calls constituted harassment under the FDCPA and Rosenthal FDCPA. The defense successfully argued that the calls were made with consent conferred by Littlejohn’s creditor. Precedent holds that a debt collector acting on behalf of a creditor who has been provided consent obtains that consent. Although Littlejohn claimed he revoked consent on January 2015, no record of a call exists, either from Littlejohn to the defendant or from the defendant to Littlejohn. The jury also found that the 75 calls placed to Littlejohn did not constitute harassment under FDCPA and Rosenthal FDCPA because none were answered. The statutes stipulate that a high frequency of calls is only actionable when it demonstrates an intent to annoy, abuse or harass. The case was tried in U.S. District Court, Central District of Calofornia, John A. Kronstadt presiding. On March 21, 2017, the First District Court of Appeal, Division 3, affirmed an order by the Alameda Superior Court in favor of Ellis Law Group's client HPROF. In HPROF, LLC v. Bank of America, NA, and Bank of New York Mellon, the Superior Court previously found that the defendant banks had waived their right to arbitrate the parties' dispute because they had litigated heavily in the Superior Court for some 21 months before seeking to compel arbitration. The Court of Appeal also affirmed the trial court's holding that the determination of who decides the issue of waiver by litigation conduct is normally for a court, not an arbitrator. This important decision was written by Justice Stuart R. Pollack. On March 2017, Ellis Law Group rescued the president of the California Guild (formerly the California State Grange) in a lawsuit brought against him to collect $144,715.70 in attorneys’ fees awarded in trademark infringement litigation against his non-profit corporation. When California Guild lacked cash to pay the court ordered fees, National Grange filed a lawsuit against the president claiming that he and his corporation were indistinguishable. Enter Mark Ellis who, as the president’s defense counsel, defeated claims in U.S. Court, Eastern District of California, that the president treated California Guild’s assets as his own, divested it of funds needed to pay the attorneys’ fees, ignored corporate formalities and acted as the sole decision maker regarding litigation. The U.S. Ninth Circuit Court of Appeals upheld on January 31, 2017 a district court summary judgment in favor of the defendant in Van Patten v. Vertical Fitness Group, LLC, a class action arising from the Telephone Consumer Protection Act. At issue was whether a fitness gym could solicit former members using telephone numbers given on membership application forms. The class action, defended at trial by Mark E. Ellis and Amanda Griffith and in appellate court by Mr. Ellis, sought damages on behalf 30,000 former gym members who received automatically-dialed phone calls and texts from Vertical Fitness. Plaintiff’s counsel argued on appeal that a signature and telephone number on a membership form did not constitute express consent to receive solicitations. And even if it did, express consent was revoked when the plaintiff terminated his membership three years prior to the solicitations. The Ninth Circuit agreed with the defense that 1) solicitations were within the scope of consent expressed by a signed membership application and 2) revocation of that consent needed to be expressed verbally or in writing by Van Patten to Vertical Fitness. Mark Ellis won a trial, Obrien v. Gjelsteen, Nov. 17, 2016 on behalf of a plaintiff who claimed breach of a written contract for hay bailing. Superior Court Judge Christopher Krueger ruled that by reviewing an invoice and writing a check for its full amount, the defendant became party to a written and fulfilled contract despite having later stopped payment on his check. The defendant had argued that the contract was unenforceable because it was not fully performed and, notwithstanding that, it was an oral not written contract whose statute of limitations expired after two rather than four years. Defense counsel Mark Ellis, Andrew Steinheimer and Amanda Griffith won a summary judgment Oct. 3, 2016 in Goodson v. Designed Receivable Solutions Inc., a class action trial arising from alleged violations of the federal Telephone Consumer Protection Act (TCPA), the federal Fair Debt Collection Practices Act (FDCPA), and California’s Rosenthal FRCPA. Allegedly the defendant violated the FDCPA and Rosenthal FDCPA by telephoning the plaintiff’s cell phone several times to collect a debt already paid. Moreover, the calls allegedly violated the TCPA because they were made using an "automatic telephone dialing system." U.S. District Court Judge James V. Selna ruled that 1) the TCPA claim failed because the defendant was given permission to call the plaintiff and 2) the FDCPA and Rosenthal claims failed because defendant's calls did not constitute abusive, harassing, or oppressive practice. 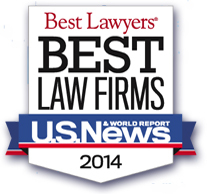 Firms, a ranking of law firms published by U.S. News & World Report and the lawyer peer-review firm Best Lawyers. Led by partner Mark Ellis, Ellis Law Group attorneys have successfuly defended hundreds of lawyers and/or law firms accused of malpractice, breach of fiduciary duty, fraud, ethics violations and malicious prosecution. More than 40 victories in attorney malpractice cases were won in trials with jury and bench verdicts. Firms selected for Best Law Firms are "recognized for professional excellence with persistently impressive ratings from clients and peers. Achieving a tiered ranking signals a unique combination of quality law practice and breadth of legal expertise." Factors evaluated by clients included expertise, responsiveness, integrity, cost-effectiveness and competitiveness. Rankings also reflect evaluations of law firms by more than 17,000 attorneys. 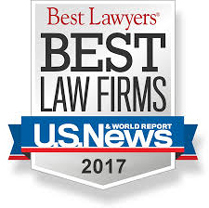 The 2017 Best Law Firms rankings can be seen in their entirety by visiting bestlawfirms.usnews.com. Andrew Steinheimer and Amanda Griffith won a summary judgment July 11, 2016 on behalf of a collection agency accused of violating the federal Fair Debt Collection Practices Act and California’s Rosenthal FDCPA. The plaintiff in Reddin v. Rash Curtis & Associates alleged the defendant’s vendor, Global Connect, wrongfully telephoned her regarding a debt of her adult son. Responding to the initial collection call, the plaintiff telephoned and then emailed the defendant demanding her number be removed from its automated dialer campaign. However, a second collection call was made hours before the number was removed. U.S. District Court Judge William B. Shubb held that a reasonable jury could not conclude that the agency’s intent or the natural consequence of the two telephone calls was “to harass, oppress or abuse” the plaintiff. Mark Ellis was named a 2016 “Super Lawyer” in civil litigation by the national attorney-rating firm Super Lawyers. The honor marked the twelfth year Mr. Ellis has been so honored. 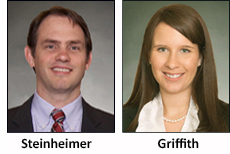 On April 6, 2016, defense counsel Andrew Steinheimer and Amanda Griffith were granted a motion to dismiss a U.S. District Court lawsuit that alleged their client, Credit Bureau of Placer County, Inc., violated the federal Fair Credit Reporting Act (FCRA), California’s Consumer Credit Reporting Act (CCRAA), and the California’s Unfair Competition Law (UCL). The case, Abbot v. Experian Information Solutions, Inc. et. al, entailed claims that the Credit Bureau failed to reasonably investigate and correct information that it furnished to Experian, Equifax and TransUnion after the credit reporting agencies notified the Credit Bureau that the plaintiff disputed their reports. The court rejected the argument that the defendant’s investigation either willfully or negligently ignored approval of the plaintiffs Chapter 13 bankruptcy plan. Click for more information. Ellis Law Group has again been recognized as a firm that lawyers themselves go to for legal representation. For the fifth consecutive year, Ellis Law Group has been named a Northern California "Top Tier" law firm in legal malpractice defense by U.S. News & World Report and the lawyer peer-review firm Best Lawyers. Firms appearing in the 2016 edition of Best Law Firms are "recognized for professional excellence with persistently impressive ratings from clients and peers. Achieving a tiered ranking signals a unique combination of quality law practice and breadth of legal expertise." Factors evaluated by clients included expertise, responsiveness, integrity, cost-effectiveness and competitiveness. Rankings also took into account 6.7 million evaluations of 55,041 individual leading lawyers. The 2016 Best Law Firms rankings can be seen in their entirety by visiting bestlawfirms.usnews.com. For the seventh consecutive year, Best Lawyers has named Mark E. Ellis one of America's leading legal malpractice defense attorneys. Mr. Ellis will be included in the 22nd edition (2016) of The Best Lawyers in America, which honors attorneys in 137 practice areas based on more than 5.5 million detailed evaluations of lawyers by other lawyers. Best Lawyers selections are also published by numerous co-sponsors, which include the Los Angeles Times. Wall Street Journal, New York Times, Chicago Tribune, Washington Post and U.S. News & World Report. Mr. Ellis has defended hundreds of lawyers and/or law firms accused of malpractice, breach of fiduciary duty, fraud, ethics violations and malicious prosecution. Certified as a specialist in legal malpractice law by the State Bar of California, Mr. Ellis is author of the bestselling E-Book,“The Defense of the Attorney Judgment—Tactical Immunity Doctrine,” which is also a chapter in Best Practices for Defending Professional Liability Claims: Case Studies From Leaders in The Field, a book available at Amazon and Barnes & Noble. To read press release, click here. Mark Ellis and Amanda Griffith successfully represented Well Fargo Bank in a trial (Wells Fargo Bank v. Weiner) arising from defendants’ claim that their guaranty of a $101,654.33 line of credit was revoked by mail prior to its payment to Village Concepts, Inc., a company since dissolved in bankruptcy. Wells Fargo had no record of receipt of the revocation. On June 29, 2015, Judge Alan Perkins of the Sacramento Superior Court ordered the defendants to pay the full amount of the guaranty, plus interest, attorneys’ fees and costs. For the eleventh year, managing partner Mark Ellis has been named a Northern California Super Lawyer by Super Lawyers, a rating service that identifies the top 5 percent of American lawyers from more than 70 practice areas. In 2015, Mr. Ellis was deemed by his peers and independent research to be a top attorney in the areas of Civil Litigation, Professional Liability Defense, Class Action/Mass Torts Defense. Mark Ellis successfully defended a winery against allegations of sexual harassment and discrimination in a two-month trial in which four plaintiffs sought damages totaling more than $45 million. Patterson v. Abundance Vineyards ended in March 2015 with a jury denying any damages to three plaintiffs and awarding a token amount to the fourth. All four plaintiffs were former employees of Abundance Vineyards, which is based in Lodi, CA. The case was tried in Stockton, CA before a jury composed of seven men and five women. For the fourth consecutive year, Ellis Law Group, LLP has been named a Northern California "Top Tier" law firm in legal malpractice defense by the 2015 edition of Best Law Firms, a ranking of law firms published by U.S. News & World Report and the lawyer peer-review firm Best Lawyers. Firms on the list are "recognized for professional excellence with persistently impressive ratings from clients and peers. Achieving a tiered ranking signals a unique combination of quality law practice and breadth of legal expertise." Factors evaluated by clients included expertise, responsiveness, integrity, cost-effectiveness and competitiveness. Rankings also took into account evaluations of law firms by more than 17,000 attorneys. The 2015 Best Law Firms rankings can be seen in their entirety by visiting bestlawfirms.usnews.com. Best Lawyers has named Mark Ellis one of America's leading legal malpractice defense attorneys in its 2015 edition of The Best Lawyers in America. This is the sixth consecutive year that Mr. Ellis has been so honored by Best Lawyers, whose publication includes attorneys in 137 practice areas located in all 50 states and the District of Columbia. Rankings are based on more than 5.5 million detailed evaluations of lawyers by other lawyers. Originally the trial court denied the motion for class certification. This decision was reversed by the California Third District Court of Appeals. A settlement, entitling class members to monetary awards, was approved by the Superior Court on June 9, 2014. Partners Mark Ellis and Andrew Steinheimer defeated in June 2014 claims by a student loan debtor in U.S. District Court that National Enterprise Systems, Inc. violated the Federal Debt Collections Practice Act and its California law counterpart, Rosenthal FDCPA. FALU-MAYSOMET v. NATIONAL ENTERPRISE SYSTEMS, INC. involved allegations that the defendant used deception and unconscionable practices to collect a debt. Such conduct, the plaintiff further argued, warranted a class action under California law. Click to read press release. A U.S. District Court of the Southern District of California ruled May 2014 in favor of a defendant fitness gym in a class action lawsuit seeking damages on behalf 30,000 former gym members who claimed the defendant violated the Telephone Consumer Protection Act by texting them two marketing solicitations. The defendant was represented by Andrew Steinheimer, Mark Ellis and Ephraim Egan. Central to the dispute in Van Patten v. Vertical Fitness Group, LLC was whether inclusion of a cell phone number on an application form constitutes express consent by the applicant to receive automatically-dialed phone calls and texts. The court held that, barring no stipulated restrictions by the applicant, express consent is conferred by a signed application. This consent continues even if membership is discontinued. Click to read press release. ELLIS NAMED 2014 "SUPER LAWYER"
For the eleventh consecutive year, managing partner Mark Ellis has been named a Northern California Super Lawyer by Super Lawyers, a rating service that identifies the top 5 percent of American lawyers from more than 70 practice areas. In 2014, Mr. Ellis was deemed by his peers and independent research to be a top attorney in the areas of civil litigation defense, professional liability defense, and class action/mass torts litigation. In January 2014, Ellis Law Group partners Theresa LaVoie and Mark Ellis successfully defended the Western Placer Unified School District before the California Third District Court of Appeals against an employee, Richard Thornbrough, who claimed he had been wrongfully terminated for among other things, First Amendment protected speech. The case, Thornbrough v. Western Placer Unified School District, also involved claims the hearing officer who heard the termination hearing was biased, as well as other supposed violations of due process. Click to read Press Release. Mark Ellis successfully defended Credit Bureau Associates in an adversary proceeding brought on behalf of Hye Rhee Kong in the U.S. Bankruptcy Court for the Northern District of California. The adversary complaint alleged violations of the California Consumer Credit Reporting Act (CCCRA), the Fair Credit Report Act (FCRA), and the Fair Debt Collection Practices Act (FDCPA). Click here to read press release. For the third consecutive year, Ellis Law Group, LLP has been named a Northern California "Top Tier" law firm in legal malpractice defense by the 2014 edition of Best Law Firms, a ranking of law firms published by U.S. News & World Report and the lawyer peer-review firm Best Lawyers Ellis Law Group was awarded Top Tier status based on extensive surveys of the firm's clients and of lawyers outside the firm. Clients were asked about Ellis Law Group's expertise, responsiveness, cost-effectiveness, civility, and whether they would refer others to the firm. Lawyers evaluated the firm's expertise, responsiveness, integrity, cost-effectiveness and competitiveness. Rankings also took into account 4.3 million evaluations of more than 68,000 of the nation's leading attorneys collected by Best Lawyers. Click for more . . .
Mark E. Ellis’ bestselling E-Book, “The Defense of the Attorney Judgment: Tactical: Immunity Doctrine will become a chapter in a paperback that will be available this fall at Amazon and Barnes & Noble. Titled Best Practices for Defending Professional liability Claims: Case Studies From Leaders in The Field, the book is being published by ExecSense. Mark E. Ellis will be included in the 2013-14 edition of The Best Lawyers in America under the specialty of Legal Malpractice Law -- Defendants. This is the fifth consecutive year Mr. Ellis has been recognized by Best Lawyers, which bases its selections on a peer-review survey consisting of almost 3 million confidential evaluations by the leading attorneys in the United States. 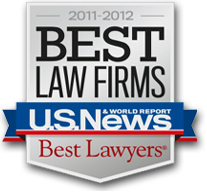 The publication has been described by The American Lawyer as the most respected referral list of attorneys in practice. Excerpts of lists appear in Corporate Counsel magazine, The Washington Post, The Los Angeles Times, New York Magazine, and more than 60 other regional magazines. For the tenth consecutive year, managing partner Mark Ellis has been named a Northern California Super Lawyer by Super Lawyers, a rating service that identifies the top 5 percent of American lawyers from more than 70 practice areas. The selection process is multi-phased and includes independent research, peer nominations and peer evaluations. Mr. Ellis was named a top attorney in the areas of civil litigation defense, professional liability defense, and class action/mass torts litigation. For the fifth consecutive year, Andrew Steinheimer has been named a Northern California "Rising Star" by SuperLawyers in the practice area of civil litigation defense. Rising Stars are "up-and-coming attorneys 40 or younger and/or attorneys who have practiced for 10 years or less." Lawyers can only be nominated by other attorneys who have personally observed the nominee in action as opposing counsel or co-counsel, or through other firsthand courtroom observation. No more than 2.5 percent of California attorneys are named Rising Stars. Mark E. Ellis and Andrew M. Steinheimer spoke on the do's and don'ts of call recording and monitoring at the Association of Credit and Collection Professionals International's 74th Annual Conference and Exposition, which was held July 2013 in San Diego. (See PowerPoint presentation.) The presentation focused on the rising tide of lawsuits, many of them class actions, brought against collection agencies for wrongful telephone practices. 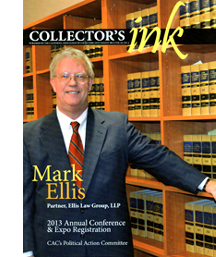 Mark E. Ellis was featured on the cover of the July/August 2013 edition of Collector’s Ink, the news magazine of the California’s Association of Collectors, Inc. Mark has represented collection agencies and their attorneys since 1987. He regularly speaks on legal issues at CAC events and is a regular contributor of articles to Collector’s Ink. (See Publications for copies of articles.). Interviewed for the “Member Spotlight” section of the magazine, Mark answered questions about his role as a collection industry advocate. Contrary to the belief of some attorneys, attorney judgment doctrines are not narrowly circumscribed. Rather, they present a broad array of rules that operate to protect attorneys when they are exercising their judgments in various ways. Mark E. Ellis, a nationally recognized legal malpractice defense attorney, examines these rules in the eBook “The Defense of the Attorney JudgmentTactical Immunity Doctrine,” whose sales rank among the top 100 by Amazon.com. 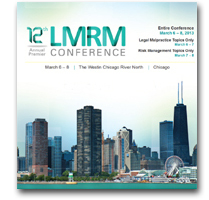 Mark E. Ellis presented an “Update on Statutory Causes of Action” at the 12th annual Legal Malpractice and Risk Management Conference held in Chicago March 6-8, 2013. Mark discussed the growing number of claims being brought against attorneys arising from the Fair Debt Collection Practices Act (FDCPA) and the Telephone Consumer Practices (TCPA). Also discussed was the impact on consumer protection expected to be made by the Consumer Financial Protection Board (CFPB). Mark E. Ellis argued before 9th Circuit Court of Appeals on February 14 in the case of Sultan Hammeed v.IHOP, an important franchise law case that will establish when the statute of limitations commences in Unfair Competition Law cases under Business and Professions Code 17208 in which the wrongful practice was ongoing. For the second consecutive year U.S. News & World Report and Best Lawyers have ranked Ellis Law Group as a "tier one" firm in the field of legal malpractice defense. The 2013 Best Law Firms rankings are based on a rigorous evaluation process that included thousands of clients and top lawyers. The national and metropolitan first-tier rankings are featured in the "Best Law Firms" standalone publication, which is distributed to 30,000 general counsel, and in a digital format worldwide. The rankings are also posted online at the U.S. News website and the first-tier rankings are featured in U.S. News & World Report's Money issue of Nov. 2012. Mark E. Ellis will be included in the 2012-13 edition of The Best Lawyers in America under the specialty of Legal Malpractice Law. Best Lawyers bases its selections on a peer-review survey comprising almost 3 million confidential evaluations by the top attorneys in the country. Its lists of attorneys appear in national publications and regional publications nationwide. Ellis Law Group has moved to newly renovated offices at 740 University Ave. Our new home is a single story building that brings our attorneys and staff together in a contiguous space, offers ample room for expansion and provides underground parking. Mark Ellis will be one of five panelists in a two hour discussion of litigation facing the collection industry scheduled for Tuesday, October 2, in Monterrey at the Annual Conference of the California Association of Collectors. Moderated by CAC General Counsel Tom Griffin, the panel of attorneys will address recent cases, new plaintiff's tactics, how to defend against consumers lawsuits, best practices and the latest developments regarding SB 890. Mark Ellis will speak on the topic "Legal Ethics and Client Communications" on Saturday, October 20, at the 34th Annual Educational Seminar of the Paralegal Association of Santa Clara County (PASCCO) in Palo Alto. Mr. Ellis will focus on the ethical considerations of transmitting sensitive client information via text messages, e-mail and social media. Mark E. Ellis will be featured as one of the nation's top attorneys in the 2012 Super Lawyers Business Edition, which will be published in September. The publication is an annual resource distributed by the attorney rating service Super Lawyersto 40,000 CEOs, presidents and in-house counsel of the nation's largest companies. Mr. Ellis will appear under the section on Litigation, one of five practice areas addressed by the publication. 2012 marks the ninth consecutive year Mr. Ellis has been named a Super Lawyer. 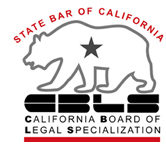 Managing partner Mark E. Ellis has been certified as a specialist in legal malpractice law by the California Board of Legal Specialization of the State Board of California. Attorneys certified as specialists have taken and passed a written examination in their specialty field, demonstrated a high level of experience in the specialty field, fulfilled ongoing education requirements and been favorably evaluated by other attorneys and judges familiar with their work. Mark E. Ellis received another favorable verdict February 12, 2012 following a four-week jury trial in San Jose, California. Their client, an attorney, had been sued for legal malpractice, breach of fiduciary duty and breach of contract. The plaintiff had sought more than $2,000,000 in damages. The jury returned a 12-0 verdict in favor of the attorney in less than 12 hours. After the verdict, the jubilant client expressed relief and profound appreciation for his representation. He stated he felt lucky Ellis Law Group had been on his side. For the ninth consecutive year, managing partner Mark Ellis was named a Northern California Super Lawyer by SuperLawyers.com and Law & Politics magazine. No more than 5 percent of a state's attorneys are selected as Super Lawyers. 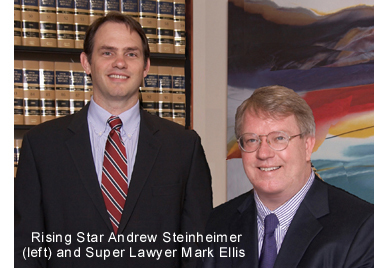 For the fourth consecutive year, Andrew Steinheimer was named a Northern California "Rising Star" by SuperLawyers.com. Rising Stars are "up-and-coming attorneys 40 years old or younger and/or attorneys who have practiced for 10 years or less." No more than 2.5 percent of California attorneys are named Rising Stars. Mark Ellis and Ronald Poirier settled a discrimination lawsuit on behalf of their plaintiff/client brought against the Transportation Security Agency (TSA), an agency of the U.S. Department of Homeland Security. The case, Zamora v. Janet Napolitano, Secretary of the Department of Homeland Security, settled for $500,000, reportedly one of the largest settlements ever paid out by TSA. The Ellis Law Group has been recognized by U.S. News & World Report and Best Lawyers as a tier one firm in the field of legal malpractice defense (see press release). The 2011-2012 Best Law Firms rankings are based on a rigorous evaluation process that included thousands of clients and top lawyers. The national and metropolitan first-tier rankings are featured in the "Best Law Firms" standalone publication, which was distributed to 30,000 general counsel, and in a digital format worldwide. The rankings are also posted online at the U.S. News website and the first-tier rankings are featured in U.S. News & World Report's Money issue of Nov. 2011. "The Paralegal's Guide to the Legal Ethics of Client Communications" is the title of a seminar Mark Ellis will present Tuesday, Nov. 22, 2011 via webcast and teleconferencing to a national audience on behalf of the National Business Institute. Intended for paralegals, legal assistants and other legal support staff, the seminar will explore modern technology's impact on a legal team's ethical obligation to keep clients apprised of case progress. For more information and to enroll, see NBI's web page on the seminar. Ellis Law Group's plans to move to 740 University Ave. to accommodate future growth was the focus of an Oct. 7, 2011 article in the Sacramento Business Journal The firm's new home will be a single story building that brings our 12 attorneys and 13 staff together in a contiguous space. 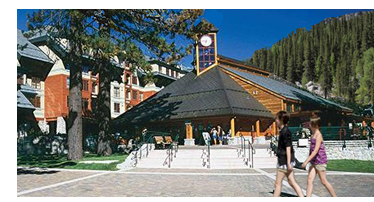 Expected to be available March 1, it will also offer ample room for expansion over the next five years and include amenities such as trial preparation space and underground parking. Mark Ellis will be included in the 2012 edition of The Best Lawyers in America under the specialty of Legal Malpractice Law. This is the third consecutive year he has been recognized by Best Lawyers, which bases its selections on a peer-review survey comprising more than 2.8 million confidential evaluations by the top attorneys in the country. The publication has been described by The American Lawyer as "the most respected referral list of attorneys in practice." Excerpts of lists appear in Corporate Counsel magazine, The Washington Post, The Los Angeles Times, New York Magazine, and more than 60 other regional magazines, reaching more than 15 million readers. For the eighth consecutive year, partner Mark Ellis was named a Northern California Super Lawyer by SuperLawyers.com and Law & Politics magazine. And for the second consecutive year, partner Andrew Steinheimer was named a Northern California "Rising Star." Rising Stars are defined by SuperLawyers.com as up-and-coming attorneys 40 years old or younger and/or attorneys who have practiced for 10 years or less. A feature on 2010 Northern California Super Lawyers and Rising Stars will be published by Sacramento Magazine in November. ANDREW STEINHEIMER OBTAINS DEFENSE JURY VERDICT IN FDCPA CASE. Jones v. CBSJ Financial Corp. (N.D. Cal. January 11, 2011): After a mere 25 minutes of deliberations, a unanimous jury rejected plaintiffâï¿½ï¿½s claims under the federal and state Fair Debt Collection Practices Act and entered a complete defense verdict in favor of the firm's client. Andrew Steinheimer tried the case in front of the Honorable William J. Alsup of the United States District Court for the Northern District of California. The case was venued in San Francisco, California. Mark Ellis will be included in the 2011 edition of The Best Lawyers in America under the specialty of Legal Malpractice Law. This will be the second consecutive year Mr. Ellis has been recognized by Best Lawyers, which bases its selections on a peer-review survey comprising more than 2.8 million confidential evaluations by the top attorneys in the country. After a lengthy and highly publicized trial, Mark Ellis won a 12-0 jury verdict Oct. 18, 2010 exonerating his clients David W. Girard and Allen R. Vinson of the Girard & Vinson law firm of legal malpractice allegations. The lawsuit was brought by the Sacramento City Unified School District, which sought $4.2 million in damages alleging the two lawyers failed to identify risks associated with an alternative pension plan they promoted. The trial began Aug. 18 and featured 26 witnesses and 3,000 pages of court documents. The Sacramento Bee ran several articles on the trial, the most recent appearing Oct 14 to report the case had gone to the jury and the last article appearing Oct. 19 to report the jury's verdict. For the seventh consecutive year, partner Mark Ellis was named a Northern California Super Lawyer by SuperLawyers.com and Law & Politics magazine. And for the second consecutive year, partner Andrew Steinheimer was named a Northern California "Rising Star" by SuperLawyers.com. Rising Stars are defined by SuperLawyers.com as up-and-coming attorneys 40 years old or younger and/or attorneys who have practiced for 10 years or less. A feature on 2010 Northern California Super Lawyers and Rising Stars will be published by Sacramento Magazine in November. An Aug. 13, 2010 article in the Sacramento Business Journal featured a class action lawsuit brought by the firm against the International House of Pancakes on behalf of Sacramento IHOP franchisee Sultan Hameed. Mark Ellis stated Hameed's damages for breach of contract, violation of unfair competition law, and other complaints could exceed $400,000. Further investigation in preparation for trial will determine if more than 1,300 IHOP franchises nationwide have similar problems, he said. Theresa LaVoie, a former president of Women Lawyers of Sacramento, has been elected to serve a 3-year term on the Board of Directors of the Sacramento County Bar Association. Mark Ellis and Andrew Steinheimer collaborated with Ronald Zumbrun to author an amicus curiae brief on behalf of the California Collectors Association in Jerman v. Carlisle, McNellie, Rini, Kramer & Ulrich LPA, a case argued before the U.S. Supreme Court in January 2010. At issue is whether a debt collector’s legal error qualifies for the bona fide error defense under the Fair Debt Collection Practices Act (FDCPA). Mark Ellis is included in the 2010 edition of The Best Lawyers in America under the specialty of Legal Malpractice Law. Selection to Best Lawyers, which has been published for more than a quarter century, is based on a peer-review survey comprising more than 2.8 million confidential evaluations by the top attorneys in the country. The advertisement-free publication has been described by The American Lawyer as the most respected referral list of attorneys in practice. Excerpts of lists appear in Corporate Counsel magazine, The Washington Post, The Los Angeles Times, New York Magazine, and more than 60 other regional magazines, reaching more than 15 million readers. For the sixth consecutive year, Law & Politics magazine selected Mark Ellis as a Northern California "Super Lawyer." 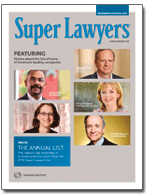 SuperLawyers.com also named Andrew Steinheimer a "Rising Star." Rising stars are up-and-coming attorneys 40 years old or younger and/or attorneys who have practiced for 10 years or less. Mark Ellis was interviewed in a Sept. 19, 2008 Sacramento Business Journal article that noted conflict must be profitable "judging by a local boutique trial and litigation law firm that specializes in going to court rather than settling cases." In two years, the article notes, the size of the firm has tripled. Mark Ellis was named a 2008 Northern California "Super Lawyer" by SuperLawyers.com and San Francisco Magazine. It is the sixth consecutive year Mr. Ellis has received the honor. Rouse v. Clark (S.D. Cal. August 2008) involved the claim that a collection attorney intentionally attempted to collect a debt owed by the father from the son by recording a default judgment against the son's residence. Plaintiff alleged that these claims violated the Fair Debt Collection Practices Act, California's Rosenthal Fair Debt Collection Practices Act, California's Unfair Competition Law, and California Consumer Legal Remedies Act, as well as supported common law claims for intentional and negligent infliction of emotional distress. Mark Ellis argued that the default judgment was recorded against the judgment debtor and that recordation of the default judgment in the county in which it was obtained was the industry practice and reasonable. In other words, there was no improper collection activity. After one week of trial, the jury returned a unanimous verdict in favor of the collection attorney, his law firm, and his staff. The debt buyer client had been dismissed by the Court after the close of plaintiff's case in chief. The plaintiff's counsel had asked the jury to award $500,000 for a lost refinancing opportunity and more than $500,000 in emotional distress damages. The plaintiff's attorney had withdrawn the plaintiff's $400,000 settlement demand after 10:00 p.m. the night before the case went to the jury. 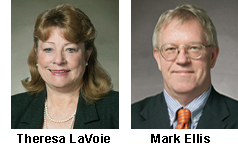 Partners Mark Ellis and Theresa LaVoie successfully defended a legal malpractice case brought against their law firm client (Bloom v. HBCW, October 2007), obtaining a complete defense verdict and exoneration for the law firm and its attorneys. After the five week jury trial, the jury also returned a favorable verdict for the firm against its former clients for their failure to pay the fees and cost incurred by the firm in the earlier representation. In rejecting the allegations that the law firm was not entitled to be fully paid, the jury awarded the firm everything it was seeking. Ultimately the client law firm was awarded total judgments exceeding $425,000 in damages, attorney’s fees and costs. Mark Ellis co-presented with Kevin Culhane a seminar titled "Rules and Procedures for Federal Court Success" in Santa Rosa on Nov. 12, Sacramento on Nov. 16, and Fresno on Nov. 30, 2007. The seminar focused on the rules and procedures particular to federal court covering case filings, discovery, evidence, expert witnesses and more. Mark Ellis joined Bonnie Anderson and E. Warren Gubler to present "FDCPA Compliance for the California Practitioner" on Jan. 11, 2008. This seminar will covered the dos and don'ts in trying to collect a debt. NBI's Web site is nbi-sems.com. Mark Ellis was part of a legal panel at a seminar presented by the California Association of Collectors at its 90th annual convention held in Monterey in October 2007. The panel discussed issues and legal trends regarding FDCPA, the Rosenthal FDCPA, and the Identity Theft Act. Theresa LaVoie was quoted as an expert on equine law in an August 20, 2007 article titled "Holding Their Horses: Attorneys Bone Up, Ride Into a Growing Legal Niche." Theresa LaVoie, president of Women Lawyers of Sacramento, was featured in an article on WLS's new officers in the April 2007 edition of The Sacramento Lawyer, a magazine published by the Sacramento County Bar Association. Mark Ellis was named a 2007 Northern California "Super Lawyer" by SuperLawyers.com and San Francisco Magazine. It is the fifth consecutive year Mr. Ellis has received the honor. Theresa LaVoie has been named 2007 President of Women Lawyers of Sacramento. an organization founded in 1962 that advocates legislative changes to benefit women and children, supports candidates for judicial and other public appointments, and sponsors events for members to meet other attorneys, judges and legislators.